I'll be giving live demos of #joiito and IM so if you're around, I might ping you. I'll be using keynote exported to QT inside of Safari with my examples loaded in tabs. The latest version of the Keynote QT is here. GRIPE : Keynote doesn't let you put hyperlinks in presentations. They should either figure out some way to embed Safari inside of a Keynote presentation or allow hyperlinks. Apple Computer presentations use two machines, one for browsing and one for Keynote. Doh. Not very user-friendly. UPDATE: Sorry folks. Didn't have a Net connection so couldn't connect to IRC or get Hecklebot working. 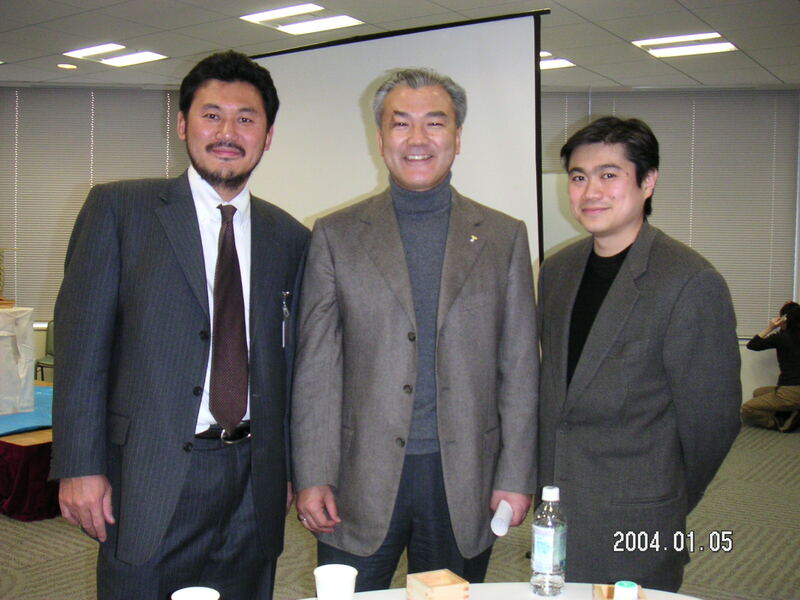 Mikitani, CEO of Rakuten, Masuda, CEO of CCC/Tsutaya and me. Photo by Ms. Noumura. About time someone else took Keynote to task for not being able to do hyperlinks - also it can't export to html. For most of the presentations I do, where I don't need anything fancy, I sure would like to have a simple tool that just built web pages with next and previous navigation tabs and looked good when projected. I keep meaning to build such a tool but haven't gotten around to it yet. You're a brave man, Joi. Most of us learned long, long ago not to try to connect to the internet during a live presentation. Murphy's Law rules. A few well-chosen screen shots usually do the trick, and are quicker, so don't bore the audience as much. If you absolutely have to do a live internet demo, save it for the end. Joi, when does this start? Ok, ok, I am blind. I see that it is around 2:30 JST. My bad. Has anyone else been able to get the stream? I'm attempting to but maybe it is my firewall? i am the lucky one to be here now in Rakuten. great speech! Sorry, the Net connection didn't work and wasn't able to log into IRC or run hecklebot. Maybe hecklebot is a jinx. Thanks Reiran! It was fun. I heard the speech today. Perhaps I got the hint of new web service from you. Thank you!! Hello Joi, are you going to make this presentation available online? It would probably be very interesting to read. Joi Ito - "Speech tomorrow at Rakuten" by Joi Ito is licensed under a Creative Commons Attribution 4.0 International License.